This patient was born with a lateral (Tessier VII) cleft, which stretched from the corner of her mouth to cheek and split through the middle of her ear. Her entire lower and portion of her upper jaw were affected. A large part of the lower jaw, facial muscles, skin, and other soft tissue were missing. Traditionally, treatment involves closure of the cheek at an early age and preparation for bone grafting. This preparation includes harvesting a portion of her rib (to make a joint) and hip bone (to make a lower jaw). The problem with this technique is the potential for scarring of the face, which will not allow for normal jaw development and failure of the bone graft or rib to consolidate well. Finally, there are times that a rib graft to the lower jaw will continue to behave as a rib and overgrow in size, leaving a large deformity. 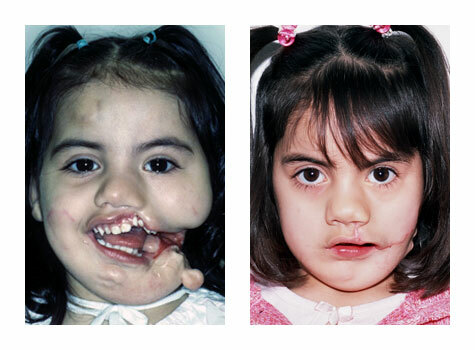 Using solely distraction osteogenesis (DO) restored much of the missing soft tissue but not much lower jaw bone. This case could only be completed with a combination of DO to produce a soft tissue matrix, and bone morphogenetic protein (BMP-2) to produce bone in the matrix that was created.